Happy Wednesday!! I’ve been anxiously waiting for this day since our first fall launch happened three weeks ago! These five new arrivals dropped today and this collection is still proving to be my favorite yet! The colors are perfect for fall (and every season really! Every piece is super versatile!) and every detail is so beautiful. 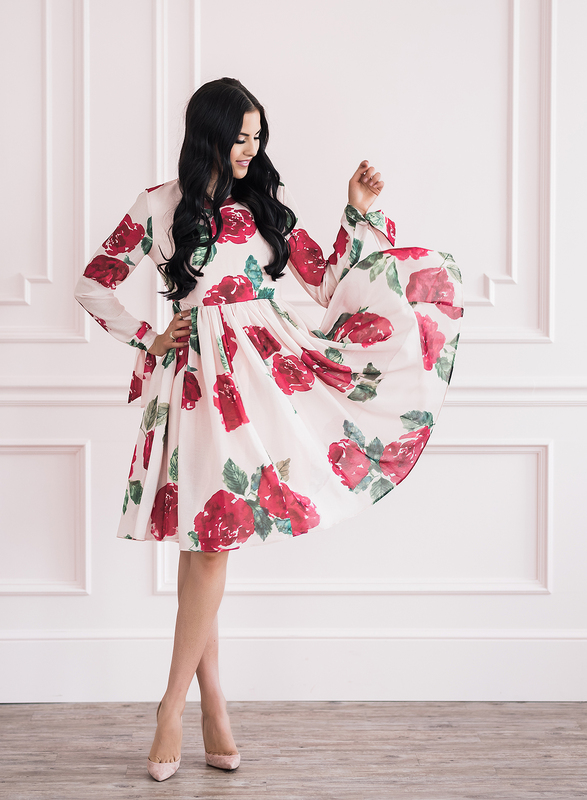 And can we talk about this custom floral print of our Plum Rose Floral Dress?! It’s even more gorgeous in person!!! Which piece is your favorite?! As always, I love to hear your feedback and thoughts on my designs! In love with the honey lace top. Thanks Rachelle! I love it too! The color of that skirt is gorgeous!! Cannot wait to wear everything! Still without electricity at our house from Irma, so I am fortunate that we were able to stay with a family member, and I am happy I was able to order. Yay!! Oh Niki! Thinking and praying for you! Love all of these deeper fall hues! So pretty! Thanks for your feedback V! I really appreciate it and we are planning to extend our sizes in the near future! Beautiful pieces Rachel! I’m curious as to the length of the harvest burgundy dress (shoulder to hem)? Thanks! ❤️? Thanks Holly!! I’d have to triple check the exact length but it does run a tad short. ahhh I LOVE all of it!! So excited to shop!! Wow, you didn’t disappoint with these new pieces! I love the deep hue and beautiful drape of the Harvest Burgundy Chiffon dress. The color of the Garden Plum skirt is absolutely gorgeous. My favorite is probably the Milan Ruffle sleeve top. Congrats on these new additions! Thank you so much Rose!!! It means a lot! That first floral dress is absolutely stunning!! I love the new collection! so beautiful! It really disappoints me that your XL is only size 10-12. I really wish you would carry bigger sizes and keep them true to other store sizes – aka an XL is usually a 14-16. I’m pretty average sized at a 12-14, and this is yet another example of how I have difficulty finding cute clothing. Never mind the women who are a larger size than me! We are in the process of expanding our sizes and hope to offer more in the near future!! Thank you for your feedback. The Milan Ruffle Top…buying this instant! Haha thanks for your support Tina! You will love it! 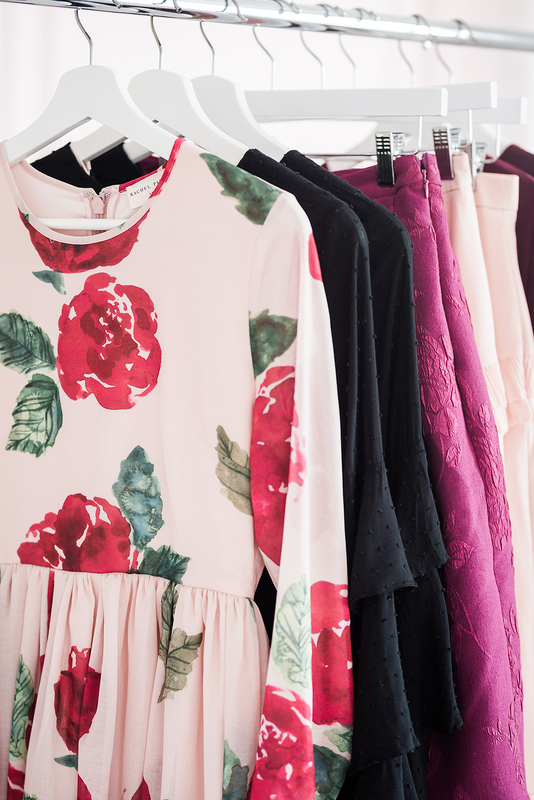 Looking beautiful in all of these outfits, there’re so many great items available for Fall! Thanks Audrey!! Glad you love it! I love all of these pieces but the wine-colored one is definitely my favorite! It look so comfy! Thank you so much! That’s one of my favorites too! Just bought the Milan Ruffle Top, love it … and the pretty rose lace skirt. I’m hoping your Flutter Sleeve dress will be restocked!!! I definitely fell in love with this black blouse! I love the HI HONEY top! Super cute name, too! I’m in love with it all! That black bell sleeve top is gorgeous!